Hello Everyone. Julia here with our final Sponsor Spotlight for July featuring Nicecrane Designs. Don't forget they are our generous sponsors this month for Astrid's wonderful Handmade Flowers and Hand Dyed Ribbons Challenge. Not entered yet? Click the challenge title for all the details and some amazing inspiration from the Design Team. I won't pretend I found this Sponsor Spotlight a breeze in the park! I do occasionally use digital images but these are usually photos which I then digitally manipulate. Mostly, I prefer to stamp images. I decided to choose two images from the 'Vintage Bathing Belles' collection. I've made two ATC's using these images. I wanted to make them look like a set so I've used the same stamps, acrylic colours, mediums, embellishments and embossed card on both. There are differences and these will become apparent as you go through the images. Hope you like them! A very sunny day for taking photos! Doesn't do justice to my rusty fish but the colours on everything else benefit from that sunshine. Two ATC's were die cut from mount board and three coats of gesso applied to seal the surface. Two pieces of mount board were cut and embossed with a Tim Holtz small strip folder. 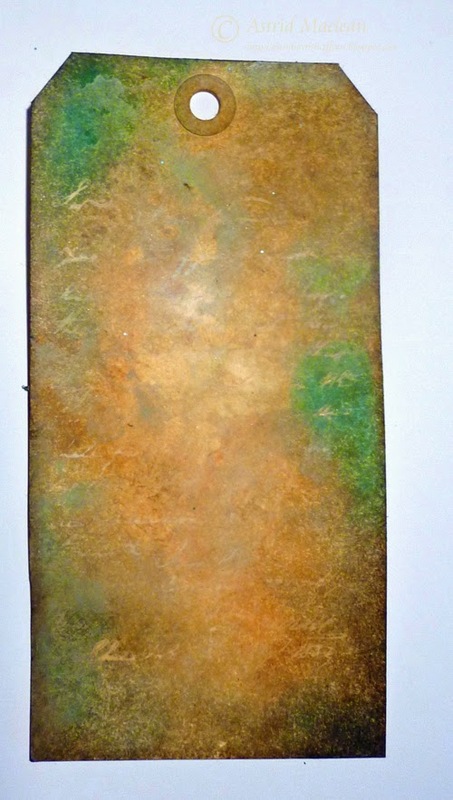 DecoArt Gesso was applied as before followed by random application of the DecoArt Media acrylic paints shown. 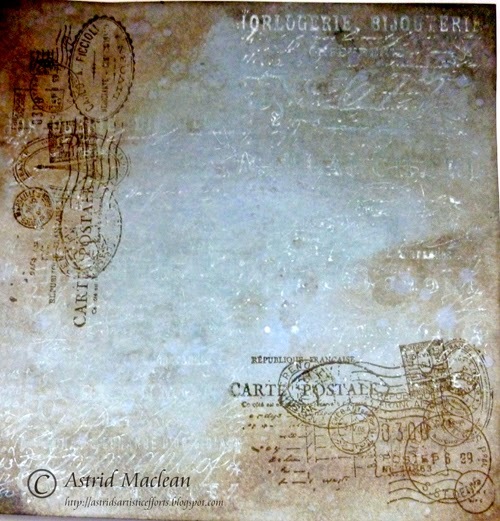 The ATC on the left was stamped with water bubble image using archival ink. The ATC on the right was stamped with the same image using versamark ink. Three shades of mica powders were then applied gently. Both were left to set and fully dry. Each chosen image was printed out onto 300gsm card. This image was finished with two coats of DecoArt ultra matte varnish on the entire surface. Both images were given a sentiment using clear tape in a label maker. 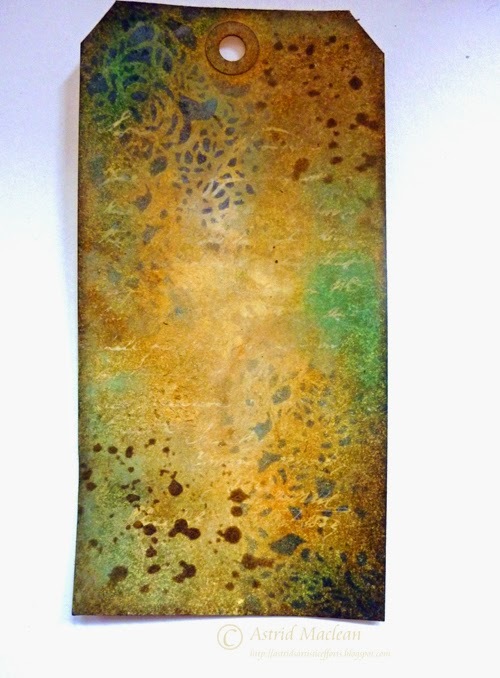 This image was given a part coat of DecoArt crackle glaze, followed by some DecoArt Traditions burnt umber paint to highlight the cracks. DecoArt ultra matte varnish was then used over the entire image to remove the shine. 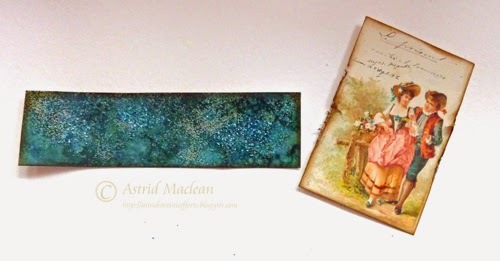 Each ATC was finished with a rusted fish embellishment. One fish is attached to a rusty wire line and the other to some colour matched 'line' (yarn in other words!). Both pieces of embossed card were given a coat of DecoArt Interference turquoise paint followed by some white embossing powder to pick out the various features of the wave design. Each piece was then given a coat of crackle glaze followed by some burnt umber Traditions acrylic in the cracks. Finally a coat of ultra matte varnish was applied to both pieces. I like how this doesn't affect the colour underneath but removes the shine from the surface making it look far more authentic. 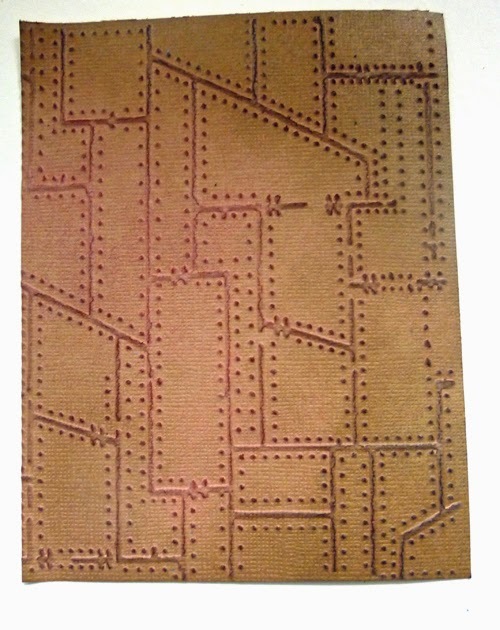 This image shows the other piece of embossed mountboard. This has more white powder embossing and less crackle glazing to give a slightly different look. I used to highlight all the cracks on a glazed project with acrylic paint or similar but I now prefer to just highlight some areas. That's me done! I did enjoy using the images and perhaps I shouldn't shy away from incorporating them in my work again. I hope you will try out some of these techniques if they are new to you. There's still just enough time to join in the fun with our Handmade Flowers and Hand Dyed Ribbons challenge. You could win the wonderful prize from our sponsor; be one of the chosen top three or even be our winner and come back to showcase your work with us. This month we are shining the spotlight on the winner of the 'Love those Leftovers' Challenge that was hosted by Linda! I live in a small village on the Cheshire/Derbyshire border...very close to the beautiful Peak District. 2. Describe yourself in five words? Not as easy as it sounds but with a little help .....Patient, Honest, Precise, Warm and Imaginative. 3. What if anything, do you consistently draw inspiration from? My first reaction is to say the natural world. I love colour and texture and when going out for a walk just can't resist touching flowers, trees and even rocks...more recently though I would say inspiration has come from blog hopping. 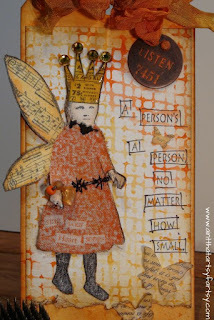 I am amazed at crafters creativity and am constantly inspired by it. 4. What is the one craft item you couldn't do without? I considered all sorts of tools or products but it's a basic I'd miss..Matte medium. 5. What is the most satisfying/exciting.....the designing or the end result? Well I've discovered recently that one depends on the other. It has to be the journey, the creative process but only if I like the end result. Keeping in touch with friends, I am loyal but so so bad at keeping in touch. 7. Whats the best piece of advice anyone has ever given you? Think before you speak. You can't undo what's said so take a deep breath, think, then speak....it works. This is so amazing Ruth! Such a breathtakingly beautiful creation! 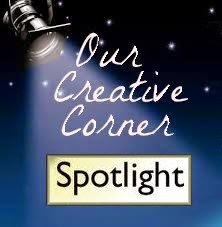 It has been such an honour to feature you today at Our Creative Corner. If you want to see more photos and details of this gorgeous creation and how it was made, then please go along to Ruth's blog a love to create and say "Hello" - I am sure she would love to see you there! All you have to do is enter Astrid's Homemade Flowers and Hand Dyed Ribbon challenge. There is one more week of Astrid's challenge left, so why not have fun creating! Hello everyone, thank you so much for dropping past here today. I cannot be sure anymore which colours I used exactly, I am guessing Rusty Hinge, Pumice Stone, Gathered Twigs and definitely some Peacock Feathers too. I chose it because the colours kind of matched the image I had chosen to use. If you look carefully you can see there is also some text stamping in there, done with Picket Fence Distress Paint. Here I added some more depth to the background by stenciling with two colours of Archival Ink, Potting Soil and Hydrangea through the Tim Holtz Doily stencil. Another bit of leftover card and my chosen image, suitably distressed around the edges. I used the strip as a kind of "belly band" and tucked the image underneath it, then embellished the tag with a flower and sentiment, a bit of trellis, a paper clay piece and a ribbon dyed in colours picking up the turquoise colours in the image. A left over piece of Tim Holtz paper altered with some Picket Fence Distress Paint and Stamping and Kaisercraft Background stamps stamped in Potting Soil Archival Ink. And here finally is the finished card. As you can see, I added a few more flowers and lace, matted first on white then on Kraft and added a few more embellishments. Below a close up of the flower cluster still. 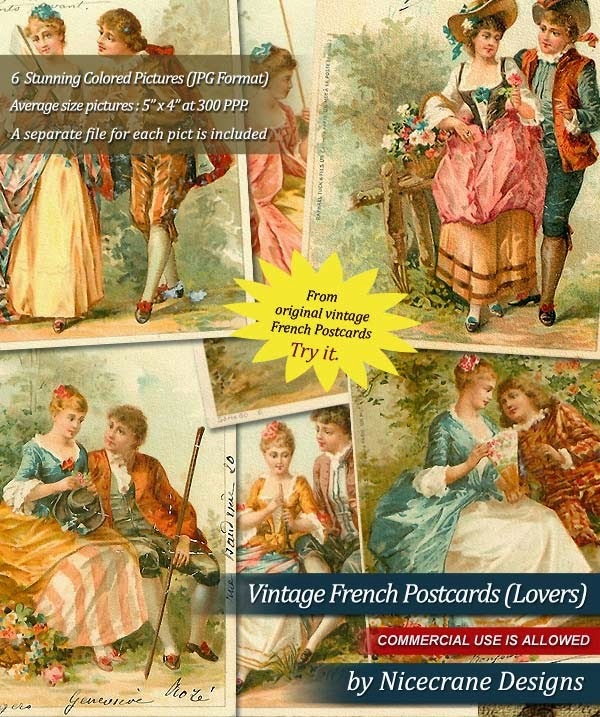 The flowers were all altered with home made sprays to pick up some of the colours in the original French Vintage Postcard. 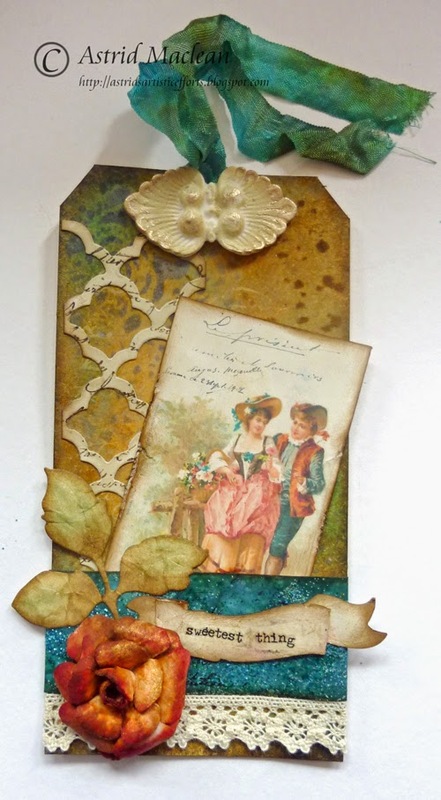 Hope you like my vintage card, and if you have not done so yet, please play along in our current challenge "Handmade Flowers and home dyed Ribbon" and you are in with a chance to win one of Nicecrane's wonderful collage image sets yourself!! Thank you for visiting and please come back on the 22nd to see the Top Talent from our "Love those Leftovers"challenge!! Hello everyone, thanks for dropping by here. As the host of this month's challenge I am so delighted to introduce you to our Guest Designer for July, the wonderful Margaret Mifsud from Margy's Paper Games. I was so thrilled and excited when I was contacted by Laura Bomber and told that Astrid Maclean wanted me to be Guest Designer for her Challenge at Our Creative Corner. I never imagined that something like this would happen to little old me!!! Thank you so much ladies you have made me feel very blessed. This Challenge is to use Handmade Flowers and Hand Dyed Ribbon on a project. I wasn't sure at first what I should create but, as I am primarily a card maker, that is what I eventually decided to do and here is what I came up with. The base is white cardstock and I used some tulle to soften the look. I then used two layers of paper from Meg's Garden's 'Correspondence' collection, tore them to size and then randomly curled the edges. Did a little background work with 'Fired Brick' Distress Ink. I simply wet a paper towel with the ink and then pounced it on the paper, I love the textured look you get from this technique. Added some circles with a bottle top dipped in gesso and created some splats with Black Soot D.I. I used two die cuts on this card, both of them are from Memory Box. The 'Snowflake Spray' was cut into two pieces, one of which I placed between the paper layers, and the other piece was used as part of the flower cluster along with the 'Honey Blossom Sprig'. The 'Chicken Barbed Wire' Chipboard piece is from 2Crafty Chipboard. I coloured it with red Acrylic paint and then randomly swiped it with some Glossy Accents and some Crackle Accents. This is actually an Easel Card and to anchor the 'Easel' I used a die cut piece from Spellbinder's 'Opulent Ovals'. The stamp is from Kaisercraft and was stamped with Memento's Tuxedo Black. The edges of the oval were inked with Fired Brick D.I. I used Tim Holtz's 'Burlap' stencil and Fired Brick to decorate the inside and added some texture with homemade texture paste and Urban Artist's 'Mini Hummingbird' stencil. Now all the incidentals are out of the way, we come to the important part of this project. The handmade flowers and the hand dyed ribbon. It's been quite a long time since I made a paper flower and I had forgotten how much I enjoyed doing it. This is a style of flower I discovered a few years ago but, unfortunately I do not remember where. There are so many tutorials out there now and, although I did find quite a number which use the same method of crinkling the petals I simply couldn't find the one that used the tulle and the stamens as well. So, I thought I would do a little step by step. You need two large flower shapes and one smaller one. It doesn't really matter what style of flower shape you use as long as the petals are cut fairly deep. You also need at least 6 stamens and a piece of tulle. You can either colour your petals as I did or simply use designer paper to suit your project. Spray the petals with water and then, using the end of a paintbrush or something similar, curl one of the petals around the handle of the brush. Hold it securely with your thumb and forefinger and then pinch it with your other hand to get the lengthwise creases. Do this with all the petals and then curl the whole piece around the bottom of the brush. This is what they should look like. The smaller flower can simply be rolled into a little ball. Let them dry completely and then, very carefully, open them up. If you've coloured your flowers, you may wish to ink the edges at this stage because some of the colour would have leeched out when you sprayed them with water. Cut a circle out of your piece of tulle slightly smaller than the large petals and then snip out some petal shapes. It doesn't matter if you end up with more petals than actual the flower itself. Once assembled, you won't notice the anomaly. Time to assemble the flower. Put a fairly large blob of glue (I used Glossy Accents) in the centre of one of the large flower shapes and attach the tulle flower. Then add the second paper flower, staggering the petals, and making sure the tulle is visible. Press down firmly in the centre until the three layers stick together. For the stamens, put two of them together and bend them in half. I then slightly twist the bottom together and fold it up slightly to make them a little shorter. You could cut them to length but I find that by folding the bottoms up they are easier to stick down. Put another blob of glue in the centre and arrange the stamens evenly around your flower. Then it's just a matter of crumpling up the smaller flower until you are happy with it and glueing it down on top of the stamens. Here is the finished flower. For the hand dyed ribbon I used Fired Brick and Walnut Stain Distress Inks. I simply pressed the stamp pads onto my mat, sprayed a little water on it and then dragged the ribbon through it. Crumpled the ribbon up (and, of course, got ink all over my hands, but that's all part of the fun isn't it??) then left it to dry and tied it into a bow. And here is the full view of my finished card. The smaller flower on the base was made exactly the same as the larger one but, of course, I left out the tulle and the stamens. I hope you enjoyed my little project and that I have inspired you to enter this challenge. There are some gorgeous prizes to be won. Thank you again, Laura and Astrid for giving me this amazing opportunity. Hello everyone. Julia back again to announce the winner and top three talent for my Flaming June challenge. What a feast of orange we had from everyone and some beautiful pieces of art. Thanks so much to you all for making this such a success and really taking the orange theme on board. I love working with colour and I know it isn't everyone's cup of tea but wow did you rise to the challenge! I must also say a huge thank you to my teamies who really pulled out the stops with their wonderfully inspiring pieces. Let's get down to business shall we? Firstly we have a randomly drawn winner who will be the recipient of the prize from Tando Creative our very generous sponsors this month. 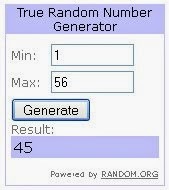 The lucky winner is. . . . . . . .
Congratulations Fliss! Please email us so we can arrange to get your prize to you. Enjoy! I loved this tag because there are several orange tones in the background which are complemented by the white substrate. The bottom layer is completely orange and both these factors fit the challenge so well. The little girl is gorgeous with her home made dress featuring machine embroidery and stamping. Love those little stockings too! Music sheet wings, text butterflies, a witty quote (I am rather short myself! ), ribbon dyed to match, an altered embellishment and finally a glossy crown with 'gemstones' were all assembled together to produce a winning make for me! 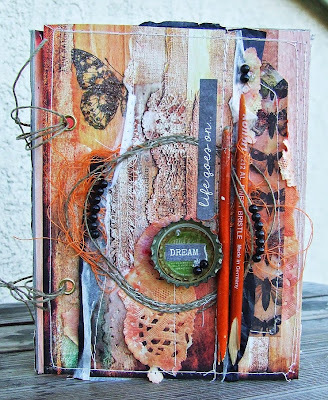 I adore this beautiful mixed media cover. So many amazing layers with colour, stamping, stitching and a variety of embellishments which produce a true feast for the eyes. The touch of grunge is just gorgeous too. It's pieces of art like this that I really wish I could see in real life and run my fingers over - quite delicious! I think we will see this talented lady quite often in the future! 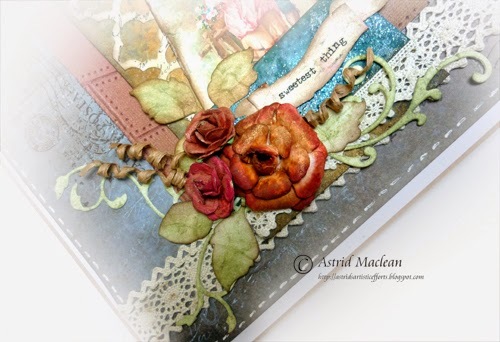 I was blown away by the beautiful masterboard that Ruth created and then used on this elegant card. The orange tones used look wonderful together along with the gold, white and black highlights. I rarely make cards but I can see myself following Ruth's tutorial (which, by the way, is a must see) and having a go at my own cards in her style. What a brilliant canvas this background would make too! I had to laugh when I read Jackie's post and she described this as being just 'too orange'! 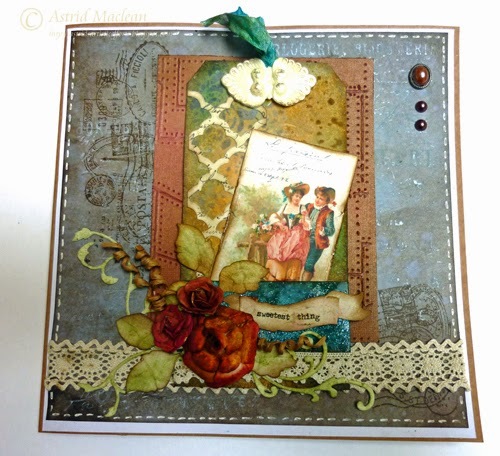 I love the beautiful background Jackie created with the different stamps and the layers of colour. The whole tag seems to glow from the middle outwards and I think this gives the piece even more depth. The black sings against the glowing background and the little black brad at the top with the hand dyed ribbon are both beautiful finishing touches. So many wonderful entries but I had to choose and I hope you will visit each of these ladies and congratulate them. Congratulations to all our winners and thank you again to everyone for playing along with my challenge and for visiting here today. There's still plenty of time to join in our Handmade Flowers and Hand Dyed Ribbons challenge hosted by the lovely Astrid. Click HERE to remind yourself of the challenge details and to see the inspiration from the DT and those who have played along so far. The challenge will continue until the 28th July but come by before then to see the DT showcasing products from our generous sponsor Nicecrane Designs. In addition, we will have a Top Talent spot and a Guest Designer spot so be sure not to miss those!